Happy fall! 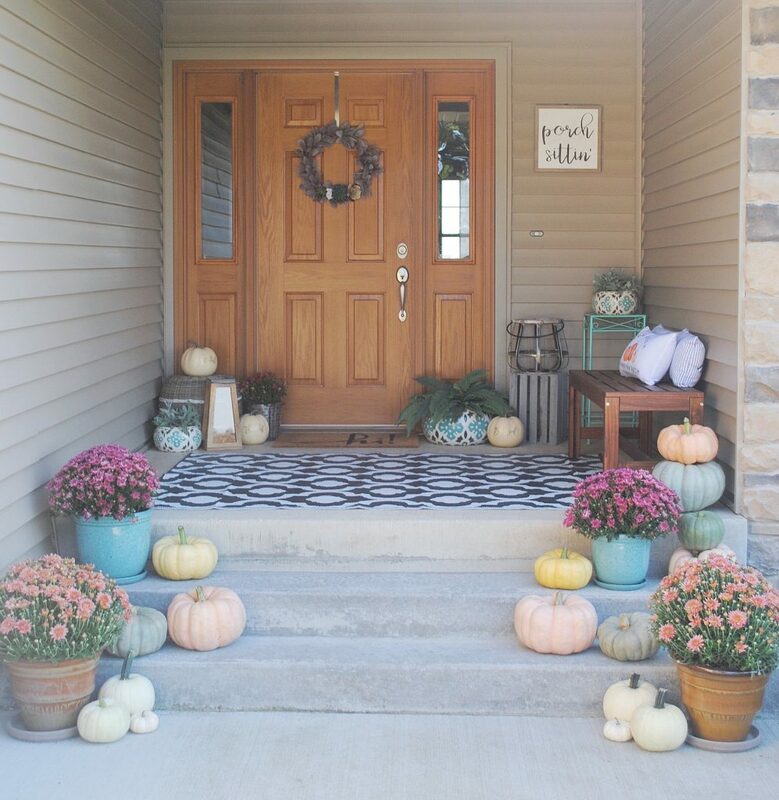 I’m so excited to be sharing my fall front porch reveal with you! While, yes, technically it’s still blazing hot in the Midwest right now, it is September…which means fall decor is in full bloom! I absolutely love all the beautiful colors and textures of the season, and fully believe you can never have too many pumpkins! 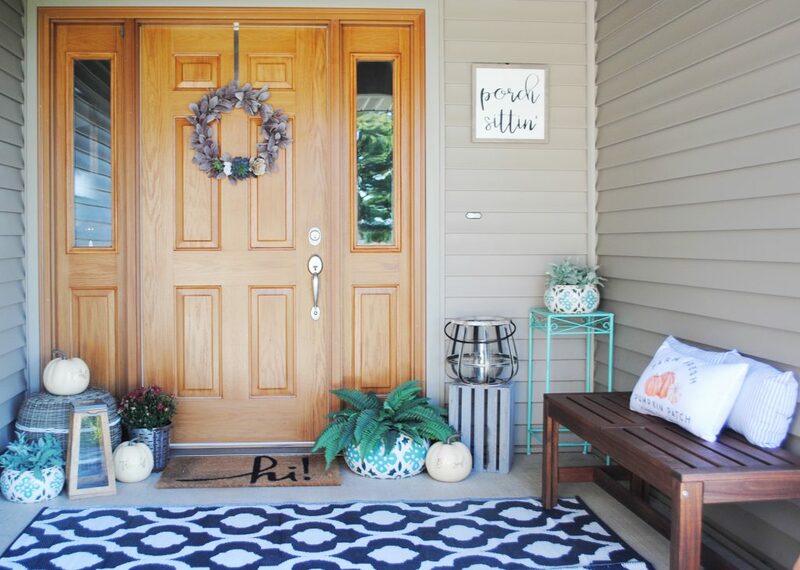 This summer I shared with you my summer front porch makeover where I started with a blank state. Luckily for me, this time around I had the basics already in place. I always try to be mindful of price when decorating, especially seasonally, so I kept as much as I could with a few minor adjustments. I am super excited to be able to provide you guys with 4 different coupon codes from each of the Etsy shops I used! Complete source and coupon code list below! 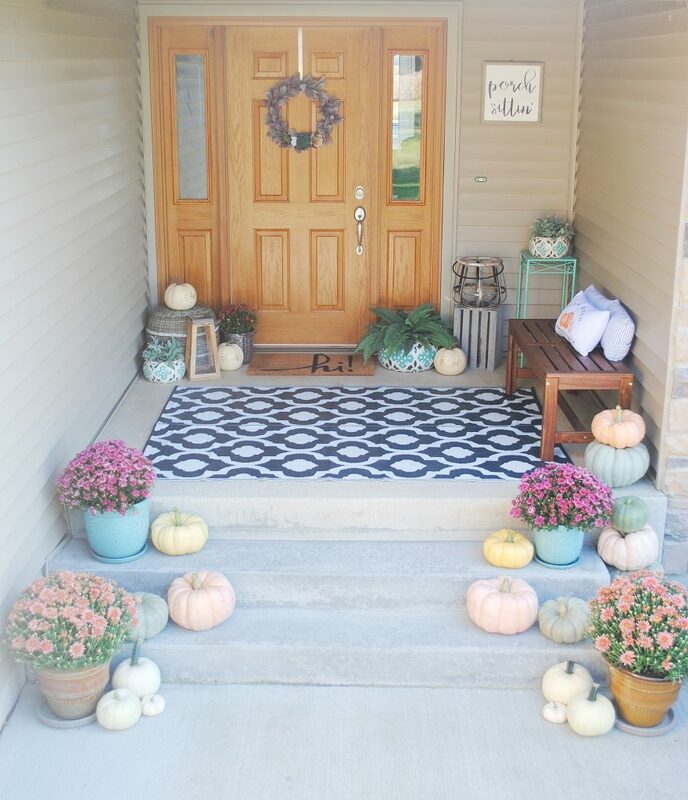 First, I swapped out the summer flowers with peach and purple mums to add color and life to the space, I also added heirloom pumpkins of various colors and sizes from our local pumpkin patch to provide even more color and texture. Pumpkins are such an easy way to add a big impact to your fall curb appeal, and I absolutely love all the different color varieties together. I chose to keep the green faux fern and eucalyptus the same to cut cost and add some greenery. However, I did add a small burgundy mum into this olive bucket I found at Wal Mart for $4.99…I could not pass up that price!! Don’t you just love a good farmhouse sign?! I found this wood Front Porch Sittin Sign on Pinterest, and knew I had to have it for the porch! I love how it works for any season, and has such a cute farmhouse feel! The quality was really great, too. Use coupon code MAMA20 for 20% off entire order from Craftee By Design. This was my first time hanging something on siding and had awesome luck with these siding and soffit hooks from amazon. They slide up under your siding allowing you to hang things without damaging your vinyl siding. I will most definitely use these again when decorating outside. Next I swapped out my wreath for this purple lambs ear wreath made from Remain Rustic. The purple lambs ear with succulent and gold accents are beautiful adding just enough color to the front door. Use coupon code FALL10 for $10 off all orders from Remain Rustic. 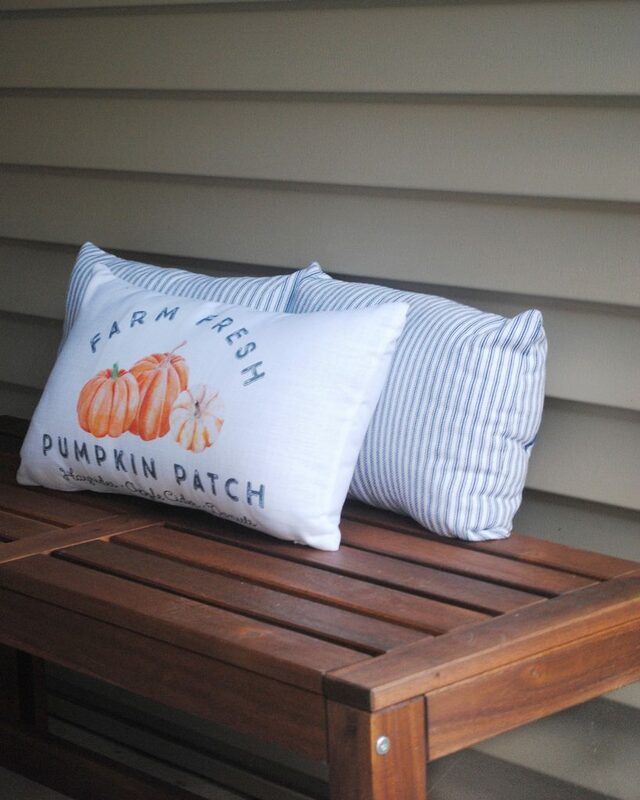 I also layered this adorable farm fresh pumpkins pillow from Everest and Gray to the bench along with two striped Target Dollar Spot pillows. This shop has tons of adorable fall pillows and mugs. Use coupon code MAMA10 for 10% off orders of $20 or more at Everest and Gray. 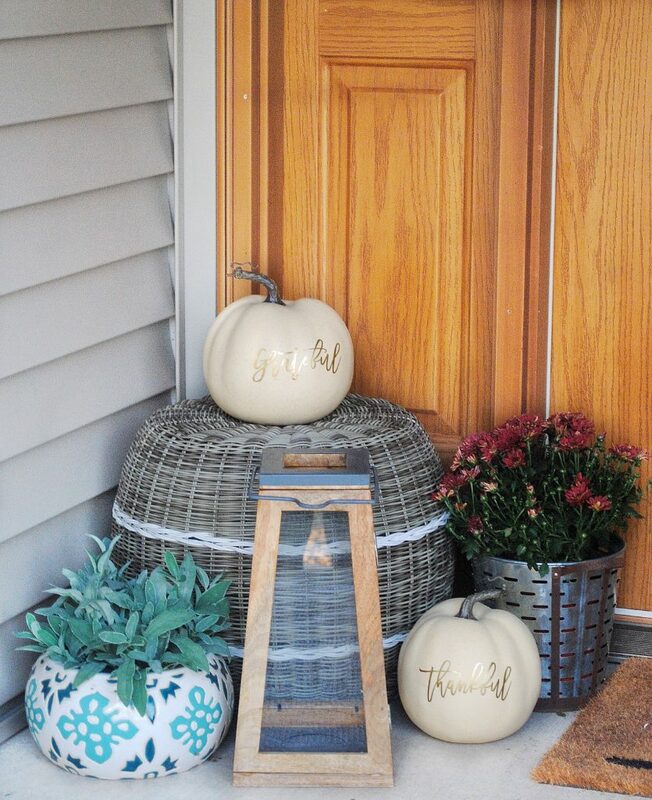 These gold vinyl decals with the words thankful, grateful, and blessed from Michisota Designs on Wal Mart crafting pumpkins created the perfect fall vignette. I love these decals and how they can be used on both real and faux pumpkins. Kristina, the shop owner, also provided me with this Trick or Trinket teal pumpkin to help support and raise awareness for the Teal Pumpkin Project. 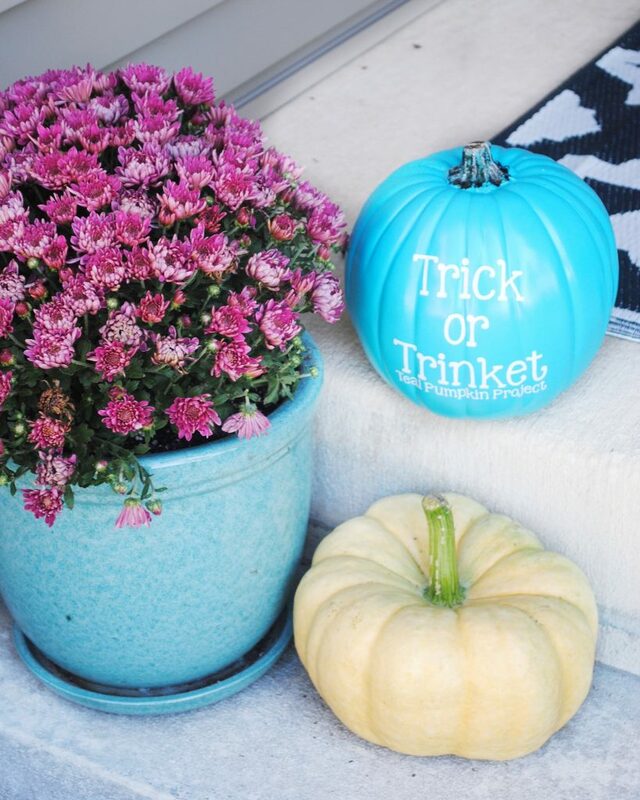 Homes with a teal pumpkin commit to provide non food options as treats for kids with food allergies, which I absolutely love and was so excited to be a part of! You can read more about the Teal Pumpkin Project here. Use coupon code MITM10 for 10% off an fall items at Michisota Designs. Thanks so much for checking out my little porch! Have you decorated for fall yet? What is your favorite season to decorate for? If you like this post, check out my summer front porch makeover.